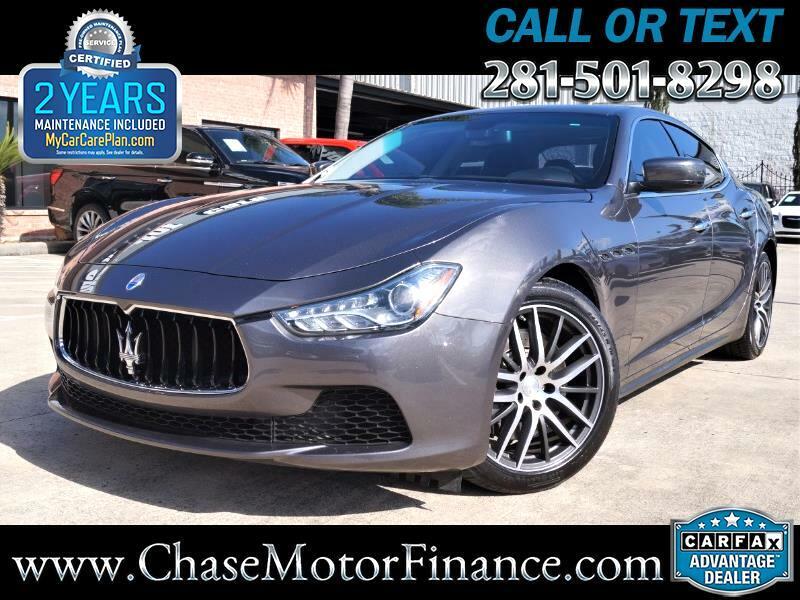 Chase Motor Finance is exceptionally pleased to present this *INCREDIBLE* 1-Owner Carfax Certified* 2015 MASERATI GHIBLI! Finished in Grigio Maratea Metallescent exterior and black interior, this Ghibli is just STUNNING! This Maserati has been well maintained through and through! The full leather interior is spotless without a hint of wear, and the glossy paint shines bright with a healthy shine of clearcoat. Mechanically this Maserati solid as a rock! Services are up to date & vehicle features Great set of PIRELLI Tires! Options Include: Heated Seats, Multi-Function Steering wheel, Navigation System, Sunroof, Premium Sound system, Camera, Parking assist , 19 " Wheels with all matching Pirelli tires, Am/Fm/CD/ Bluetooth, Full Power Seats, Two set of keys, Smart Device integration, and More! Our mechanics have thoroughly inspected this Maserati and have found no mechanical problems! The drive is excellent, no shakes or pulls. The 3.0L V6 engine is responsive and the automatic transmission shifts smoothly. Don't miss the chance to own this Beautiful Porsche. Feel free to contact us should you have any questions!! !